Before kids (BK) I enjoyed ultra marathons, Ironman distance triathlons, mountain climbing and adventure racing. 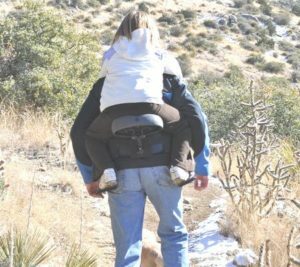 When my daughter was small, I would carry her in a baby backpack and we would enjoy the great outdoors. When she turned three, she no longer fit in a baby backpack and our hikes often turned into her playing in the dirt and me with a sore back. 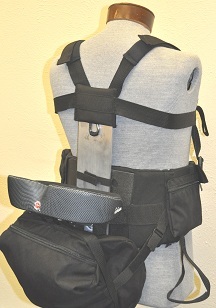 Having a Duke Mechanical Engineering degree and the owner of a sewing company, it did not take long for me to design and build a backpack that allowed us to get back on the trails. My goals were to get her wait off my shoulders and spine and onto my hips and legs. Also I wanted the pack to be easy for her to get on and off of. The first pack was not pretty, but it worked great. My back was no longer sore and we could travel further and faster than ever before. She would hike and I would catch my breath. She would jump on and I would get a great workout. Lots of people on the trail, on the beach, at the zoo and at Disneyland looked in amazement and often asked where I bought it. It wasn’t long before version one turned into a refined version 12 and paperwork was filed for a patent. A few years later, we received our patent, produced our first 1,000 packs to get the costs down and started getting the word out. I hope that you enjoy your Piggybackpack as much as my kids and I have. Click Here to get Your PiggyBackPack!